There is a great deal of new material to see in the exhibition “Otaki Remembers World War I”. A display on the ship Otaki, the second of that name, features paintings by Otaki artist Wallace Trickett. This ship was torpedoed in 1917; the captain went down with his ship and was awarded a posthumous Victoria Cross. The Otaki Shield commemorates him. There are also new displays on several Otaki soldiers who served in the war. 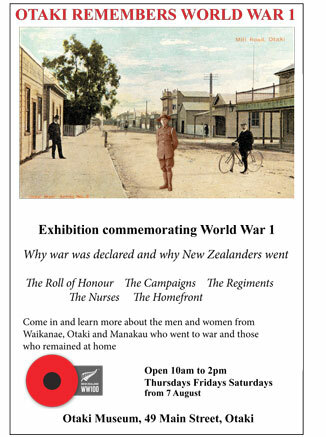 The Otaki Museum is at 49 Main Street and is open Thursdays, Fridays and Saturdays 10 am – 2 pm. Next articleIs there financial assistance available for you?